This page is out of date but remains for past informational reasons. Please see the Benefits Page for up to date information. On August 21, 2013, at 7PM, there was the final forum at IBEW Local 180's Training Facility upstairs. The Forum discussed the upcoming Plan change to the Kaiser coverage for active participants under the Inside Agreement. This was an informational meeting as the action to make the change to the high deductible plan has been made. If you still have questions that you feel will benefit the group as a whole, please forward them to Dan and he will get answers from the plan professionals and then share them with the membership in future newsletter articles. Here is all the important information and links concerning this subject. Email Mike Smith if you cannot find something or find a bad link. Kaiser Sample Fee List - New VEBA / Reimbursement Form use one form per person and submit when you have reached $250. BeneSys Frequently Asked Questions (FAQ's) and all mailings concerning H&W FAQ's at top; scroll down to see Health & Welfare Plan Change mailers. Past Newsletter article on the Kaiser Change and the article showing the table of decutibles, coinsurance and co-pays. You can receive tax-free distributions from your VEBA (HRA) to pay or be reimbursed for qualified medical expenses you incur. IRS rules for HRA's can be found in Publication 969. "qualified medical expenses" can be found in IRS Publication 502 starting on page five. Videos on how to complete the deductible / coinsurance reimbursement form. Two versions; Windows and MP4 for everything else. If they do not open, right mouse click and "save as" to your HDD. Less than five minutes long and go slowly, pause if it is too fast. Best to view full screen. Feedback welcome. This is the number one place to gather detailed information on the coverage. The information from the newsletter article showing the table came from this site. If there's a discrepancy between what's displayed on this page and the current Evidence of Coverage (EOC) for your plan, the EOC will govern. Please refer to your EOC for a complete description of your benefits. 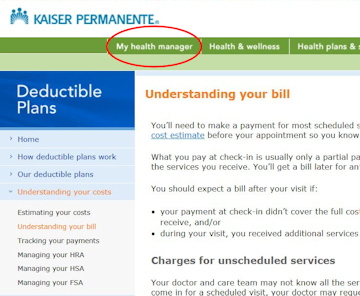 Kaiser Permanente reserves the right to make determinations about your coverage based on the benefits information and all other terms and conditions set forth in the EOC for your plan. For an explanation of what a particular word means, check the glossary. If you have any questions about this information, please call our Member Service Call Center at 1-800-464-4000 (toll free) or 1-800-777-1370 or 711 (toll-free TTY for the hearing/speech impaired), 24 hours a day, 7 days a week. The Member Service Call Center is closed on holidays, and closed after 5 p.m. on the day after Thanksgiving, Christmas Eve, and New Year's Eve. Kaiser Permanente Medicare health plan members please call 1-800-443-0815 (toll free) or 1-800-777-1370 (toll-free TTY for the hearing/speech impaired), 8 a.m. to 8 p.m., seven days a week.